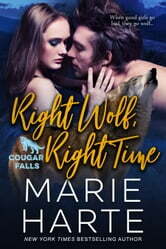 The sixth stand-alone romance in New York Times bestseller Marie Harte’s small town, shapeshifter romance series: Cougar Falls. When good girls go bad, they go wolf. Shapeshifter Monty GrayClaw has lived a wild life. A youth spent in Cougar Falls hadn’t prepared him for the outside world, or for hunters—humans who capture and slaughter Ac-taw. They nearly killed him before he escaped years of torture. Now living safely in Cougar Falls once more, he’s trying to put the past behind him and look toward the future. That future includes Sophie Tanner, a shy woman new to both her Ac-taw heritage and the town. Sophie is a sweet, lovely young wolf who calls to everything inside him. When an enemy from Monty’s past tracks him down, it will take the gentle woman with a will of iron to save the day. But when their shared history comes to haunt them both, can Monty save his mate, or will she leave him and Cougar Falls behind forever? Warning, this title contains the following: A slow moving wolf and a shy virgin with an addiction to adult movies, date nights gone wrong, and bad guys with bite. But when the good girl goes bad, stand back and watch the fur fly.